Sambucus nigra, commonly known as elderberry, has been used for medicinal purposes for hundreds of years. All parts of the elderberry tree--including the berries, leaves and bark--have curative benefits, including boosting of the immune system, improving flu symptoms and lowering cholesterol levels. Despite the many positive effects of elderberry on the body, it is important to ingest the correct doses to avoid potentially serious complications. Every part of the elderberry plant contains cyanogenic glycosides, which is a substance that releases cyanide. Sufficient ingestion has the potential to cause dangerous levels of cyanide to build up within the body. While the flowers contain slightly less of this element, the stems, leaves and bark of the elderberry plant are particularly dangerous and should never been consumed, according to the World Health website. Small children can be poisoned simply by chewing or sucking on the bark of this plant. The consumption of raw or undercooked elderberry berries can lead to several different types of gastrointestinal ailments, including severe diarrhea, vomiting and nausea. These negative effects can also be caused by ingesting elderberry juice if the juice was produced by crushing the leaves and stems of the plant, according to the Medline Plus website. All parts of the plant, especially berries, should be cooked in order to eliminate the threat of gastrointestinal distress. Elderberry is a member of the Caprifoliaceae family, which includes honeysuckle and snowberry. Individuals with an known allergy to this plant family may also experience an allergic reaction to sambucus nigra. Direct contact with fresh stems of this plant can cause several different types of allergic reactions, including skin irritation and rash, according to the Medline Plus website. Difficulty in breathing has also been reported. Elderberry may interfere with the effectiveness of certain medicines taken to decrease the immune system. 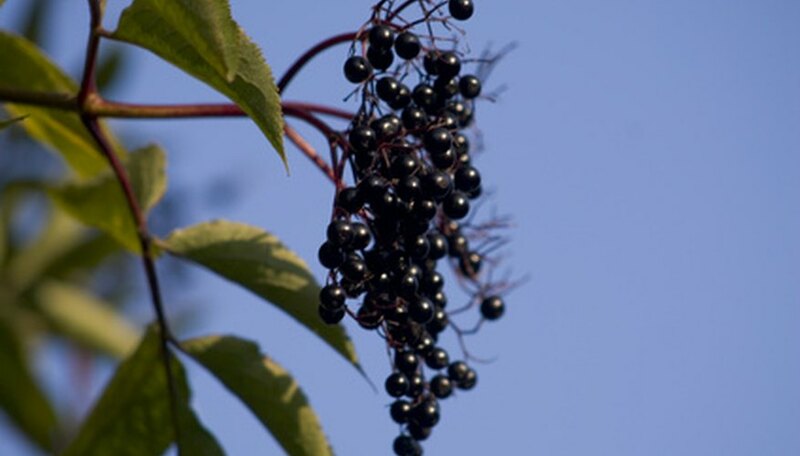 Elderberry tends to greatly increase the body's level of immunity. Taking this herb in combination with an immunosuppressant drug may decrease the drug's level of efficiency, according to the RxList website. Individuals taking medications used to treat autoimmune illnesses should not consume eldeberry. Pregnant woman should avoid ingesting elderberry entirely due to the risk of birth defects or spontaneous miscarriage. Incidences of gastrointestinal distress are also increased when this herb is consumed by pregnant women. Additionally, mothers should not consume any part of this plant while breast-feeding, according to the Medline Plus website. Elderberry acts as a diuretic, which increases the amount of urine in the body, while decreasing the levels of excess fluid. When this herb is taken simultaneously with a commercial diuretic, the likelihood of dehydration is significantly increased, according to the University of Maryland Medical Center.